Nothing breathes summer like the smell and taste of slightly blackened marshmallows. I have yet to get up to the mountains and build a sweet bonfire to cook my mallows over. Does that mean that my summer has not yet begun? Last night I needed some. It wasn't a want, it wasn't a casual desire, it was a matter of life and death. I needed some marshmallows. After cleverly concocting a plan to go to the grocery store (we were out of soap) I rushed out into the night, purchased the sweet contraband and ripped into the bag, popping a large soft gooey delight into my mouth... and was bitterly disappointed. I ate a couple dozen more. I guessed those marshmallows must have been off. Well, this morning, while trying to get over my sore let down from last night, I ate another. Did you know you can roast marshmallows in your oven? Just turn it onto broil, grab a meat fork (you know, the really long metal two pronged fork) and patiently hold the mallow up to the broiler. I don't even have a gas oven, and it still worked. Realization and relief swept through my body as the warm morsel slowly oozed down my throat in all it's yummy goodness. The marshmallows weren't off, it was me. I didn't need just any marshmallow, I needed a roasted marshmallow. And then once again, all was right in my little universe. Yeah, I remember you roasting marshmallows over our oven in the Bountiful house. Oh those were the days! Did I really? I don't remember that. Hmmm, here I was thinking I had just gotten creative when it had already been done (albeit by me). Well, when you have to have roasted marshmallows, necessity is the mother of invention, right? Well, that is good to hear. The burners are probably a little safer than the oven when a little one is running around, so I am going to have to try that next. THanks Leslie! Megs, you are so invited to come along on my next mountainous picnic. I always burn them, or toast the outside and the middle is still slightly solid. Granted, I have grown to like the slightly burned taste, but really, the best ones are the perfectly golden browned ones. Amen. I think if everyone had a roasted marshmallow on a regular basis, everyone would be much happier and the world would be a much better place. I completely agree with you. 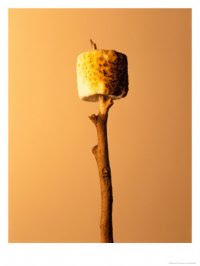 There should be a National Roasted Marshmallow day. I think it would help the economy, help with disease and everything!